FULTON, NY – A presentation to the Board of Education surrounding graduation rates within Fulton City School District shows a 7% increase from last school year. 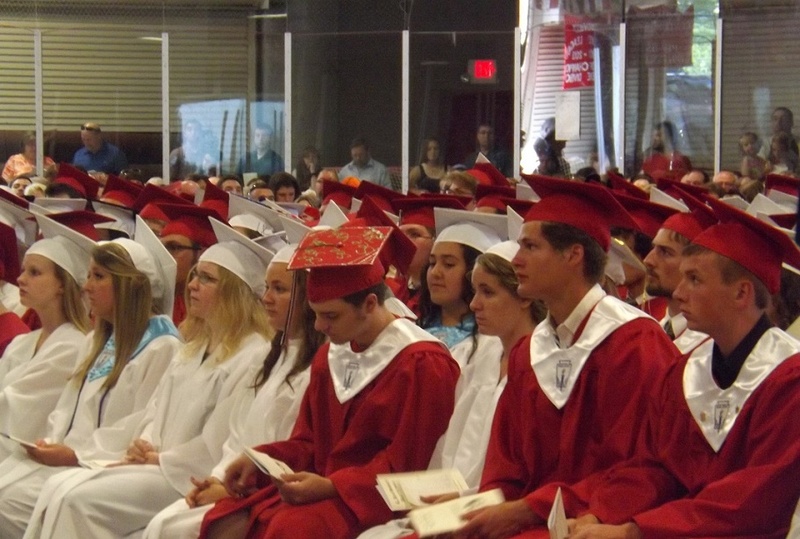 Of the cohort of students that entered the high school in the year 2012, 76% of FCSD students graduated in June 2016 with a Local, Regents or Regents with Advanced Distinction diploma after four years. This number is an increase from 69% in the previous school year, a total increase of 7% that school officials find worthy of recognition and celebration. “We really want to recognize (principal) Donna (Parkhurst) and everyone at the high school for narrowing their focus on this and making it happen, they’ve really targeted a student-by-student approach,” said Betsy Conners, executive director of instruction and assessment for the district. At G. Ray Bodley High School, she notes that school officials started a new approach to students who begin slipping in their academics or other areas of their education that could adversely affect their course to graduation. By creating “wanted posters” for at risk students that include their picture and courses in danger and making it available to any teachers or district staff that hold a personal relationship with the student, students become aware that they are on their teacher’s radar, which Conners said is a large contributor to getting students back on track. Conners shared that the process is not solely at the high school, it was a district wide effort and even elementary teachers were aware of at risk students and used their connections to steer students in the right direction. Previously, district officials set a goal in the Comprehensive District Education Plan to raise their graduation rates by 5%, a goal that has been achieved with surplus. “A lot of blood, sweat and tears went into this accomplishment so we really want to recognize that,” Conners said. The current graduation rate of 76% falls just short of the NYS graduation rate overall at 79% as well as the goal set by the US Department of Education to graduate 80% of students. However, when comparing “apples to apples” with similar school districts in regards to size, FCSD outperforms the likes of Rome, Watertown, Cortland, Amsterdam, Auburn City and Gloversville school districts. “This fits right in to (Superintendent Pulvino’s) vision to make Fulton the number one small city school in New York State and the country,” Conners said. While the number of enrolled economically disadvantaged students continues to increase and the number of not economically disadvantaged students continues to decrease, graduation rates among both subgroups remain vastly different. Economically disadvantaged students hold a 62% graduation rate within their subgroup while not economically disadvantaged students hold a 94% graduation rate, what Conners referred to as “a tale of two schools” that district officials will continue looking into to close the gap. Another subgroup being monitored is one that follows the opposite of the national trend, Conners said as males at FCSD are graduating at a rate that is 10% higher than females. Additionally broken down by subgroups, students with disabilities graduate 54% in four years and general education students graduate 79% in four years. On the contrast, district drop out rates are on the decline. For all FCSD students in the cohort entering high school in 2012, the drop out rate was 6%, down from 10% the previous school year. This rate is significantly lower in comparison to similar school districts throughout NYS. The district was able to increase graduation rates while maintaining their record for several years of spending less per pupil than other similar districts and NYS without sacrificing programs or student services. Conners said the district will continue in their successful efforts to target graduation rates and will set a new goal moving forward to continue seeing improvements because “Ultimately, getting a student to graduate changes their life,” she said. It’s so good to see some POSITIVE news out of Fulton for a change! I mean other than Aldi coming to the Nestle’ plant location and all the asbestos being removed from the site ? This news on the surface is encouraging and uplifting. You have to look beyond and into all aspects of these figures. First up is the fact that we are happy that only 3/4 of the students entering HS are graduating. Looking further is the lack of numbers in the total group and in the sub-groups. The fact that the number of disadvantaged economically have increased and those of economically advantage have decreased. What is the income level that puts each into each group. So which sub-group has increased in graduation rate and has a sub-group declined or have we just moved students into different sub-groups to make the numbers work in our favor. Only a little over half of the students in the disadvantaged economically sub-group are graduating. That is sad. That is the group that needs the education the most and will help reduce our poverty rate and crime rate. So like I said in the beginning. This is great news on the surface but we must look deeper and require more. It seems that we achieve success by lowering our expectations. A few hundred are transported from a 50 mile radius to the Fulton City School District at tax payer expense because they are considered “homeless,” and by federal law, the district has to educate them. How is that fair to local taxpayers? We have to pay to transport and educate kids that live in other school districts.